Soffit vents are paramount to the success of a ventilation system in a buildings’ structure. They grant cool air entry to flow from the lowest point, circulating cooler air into warmer air as it rises, where it then exits the building. It’s essential to get the right amount of net free area with balanced intake and exhaust vents. These particular models come in a 4 or 6 inch pipe to fit specific sizing needs. See chart for individualized net free area specs. Having equal amounts of intake as well as exhaust vents are imperative in the success of the overall ventilation system. More of one over another jeopardizes the integral structure and well-being of the structure. Under eaves grant way for plenty of natural airflow circulation. These round shaped vents appear to look like speakers, but actually are for air intake. They stand up robustly to harsh weather conditions and are very durable. Perfect for remodeling or replacing old, discolored ones, these vents will do the trick. Purposed for bath or dryer venting applications, we carry duct reducers allowing to go from a 4 inch pipe down to a 3 inch. Ideal for reducing from one duct size to another while still admitting maximum amount of airflow. Make certain to fasten securely, ensuring a tight seal not allowing airflow to leak through for utmost efficiency. Not only will this save on heating and cooling utility bills, but it will conduct a well-maintained ventilation system. 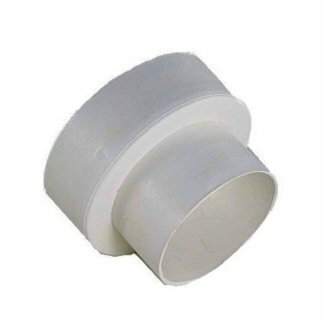 These duct transition pieces are easy to install and are available in a white round plastic finish. Shop our quality duct reducers now and never worry about the workmanship. Soffits are the underside of any building structure; mostly referring to the piece where the siding ends and the under part of a roof meet. They are positioned underneath the roofing overhang and act as the predominant intake for attics. These soffits allow for bathroom exhaust fans ventilation. 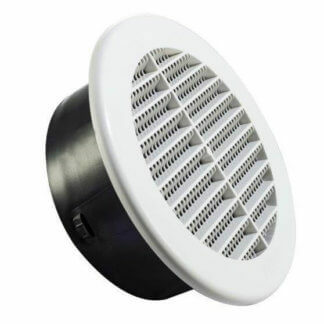 With fixed louvers, this vent also contains an insect screen to detain pests from entering. Available in brown or white round HDPE (High Density Polypropylene) plastic built for longevity. Comes in either 4 or 6 inches to fit the connecting pipe segment. Easy to install, this piece just snaps right into place. No special tools are required! Enjoy the convenience of a one stop shop that comes with a piece of mind. Our quality is top-notch and our products stand true to the test. You will be glad you chose us. 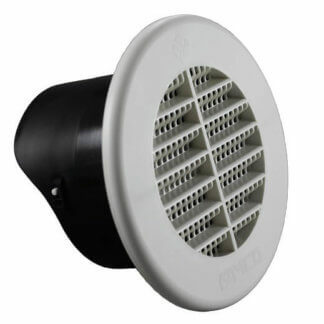 Shop our top-rated and easy to install soffit vents today to get the job done with ease. Requires just one hole to effortlessly put in place. This durable and yet affordable plastic construction will hold up well against time and the elements. Use FAMCO for all of your venting needs and enjoy our fast and convenient shipping options. Pick up some durable, yet affordable vents today!